I saw my pulmonologist last week and the news was bad. So. With that, plus the disturbing state of politics and the suspicion that nothing really matters anyway because the world will be ending soon, I’ve been distracting myself with a lot of high-quality entertainment which I will now share with you in case you need to escape from reality for a while, too. 1. http://mcmansionhell.com After you’ve laughed at the appallingly ugly houses until you can’t breathe, you can read Kate’s informative “McMansion 101” and learn exactly why McMansions are so terrible! 2. I think I mentioned the “You Must Remember This” podcast a few months ago, but I’ll tell you again how great it is. Karina is currently doing a series on Dead Blondes. Fascinating and so tragic. Do listen, won’t you? http://www.youmustrememberthispodcast.com/search-archive If you’re a new listener, start with Peg Entwistle (January 2017) and go through the Dead Blondes series with me. I like all of these comedians and they made me laugh a lot but the funniest stand-up special of all (so far) was “Mike Birbiglia: Thank God for Jokes”. I’ve been a Mike Birbiglia fan ever since I heard his bits on This American Life. “Thank God For Jokes” made me laugh and laugh and LAUGH. Hang in there, everyone. Enjoy the fresh air, clean water, and healthcare while you still can. http://www.dailyactsofresistance.org and I call the politicians who need to be called. I am simultaneously ashamed of (less than) half my country for electing this dangerous fool, and incredibly proud of (more than) half my country for vocally resisting the evil machinations of Trump and his henchmen and puppetmasters. The day of the Women’s March, two Saturdays ago, I watched in awe as people all over the world demonstrated with peace and strength and unity, and I felt hopeful for the first time since the election. 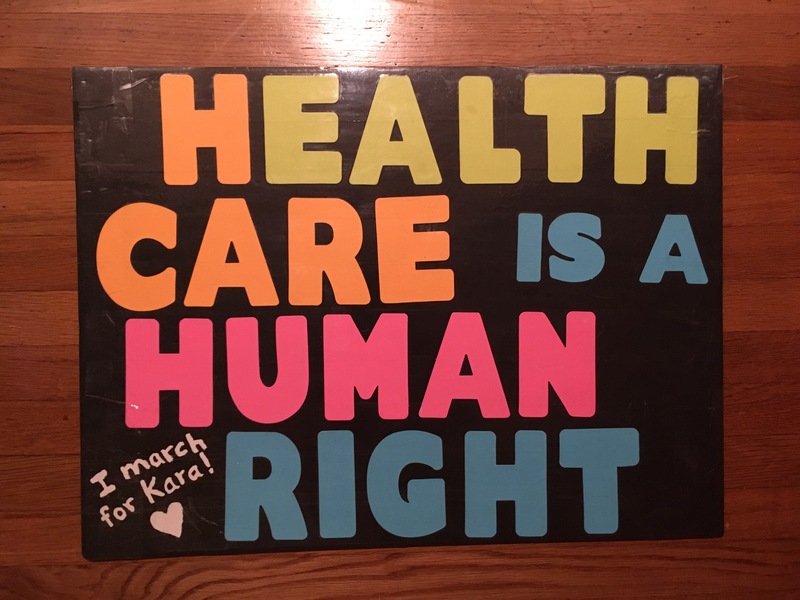 I’m not able to join such protests because of my disabilities, but my cousin, brother, sister, and aunt all marched and protested, and added my name to their signs so that I could be with them. Almost immediately our wonderful strong brave citizens of all faiths showed up at airports in thousands to peacefully protest. My brother in NYC joined the protest there (have I mentioned how proud I am of my family?) and since I could not march, I donated to the ACLU. I have been phoning and mailing our representatives and I understand that they’re receiving an unprecedented amount of anti-Trump, anti-Bannon, anti-fascism communication so I’ll continue. According to The Washington Post, the State Department has temporarily reversed the Muslim ban: https://www.washingtonpost.com/politics/state-dept-reverses-visa-revocations-allows-banned-travelers-to-enter-us/2017/02/04/0ab5880a-eaee-11e6-bf6f-301b6b443624_story.html?utm_term=.964fa419d6bf But of course that’s only temporary. If you, my dear listeners, have been protesting and resisting, please keep it up! We must stay strong, we must be vigilant. We /must not/ let hate, bigotry, racism, selfishness, ignorance, greed, and misogyny prevail. This country is better than that.